archangel derives from the Greek archángelos, (or arkhangelos), meaning chief angel. So we can conclude that archangels are in charge of other angels and/or cosmic activities. Archangels are, in a way, celestial captains - high-ranking divine officials so to speak. 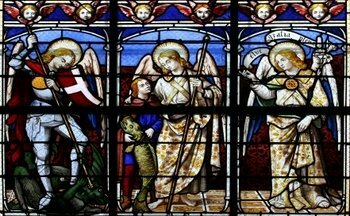 In medieval Christian angelology, archangels belonged to one of the nine orders of angels. Interestingly, according to this angel hierarchy archangels are one of the lower orders, just slightly above the angels. How many archangels are there? The answer depends on who you ask. The Roman Catholic Church, for example, only recognizes three archangels: Michael, Gabriel and Raphael. The Coptic Church recognizes Uriel as the fourth archangel. The Coptic tradition also venerates Aniel, Sarathiel and Zadakiel as archangels. 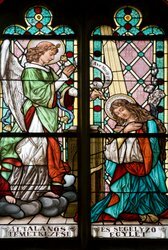 Because Michael is the only archangel mentioned by name in the Bible (in fact, he’s the only angel addressed as "the archangel"), Protestant Christians believe he is the only archangel. The Eastern Orthodox Church venerates seven archangels: Michael, Gabriel, Raphael, Uriel, Barachiel, Jegudiel, and Selaphiel. The 7 archangels are first mentioned as a group in the Book of Enoch. Here they were listed as Michael, Gabriel, Raphael, Uriel, Raguel, Remiel and Saraqael. In medieval times, Pseudo-Dionysius would give a new list of the archangels: Michael, Gabriel, Raphael, Uriel, Chamuel, Jophiel, and Zadkiel. Metaphysical teachers and New Age mystics also recognize these as being the seven archangels who work on the seven rays. Metaphysical teachings reveal that the cosmos’ activities are supervised by seven directors who work under the auspices of the seven rays. Each ray focuses on specific divine attributes and activities. Each ray also has an angelic director. These are the seven archangels of the seven rays. Archangel Michael. Michael, known as the First Angel of Heaven, is the angelic director of the Blue Ray. The Blue Ray is the ray of Protection, Faith and the Will of God. It is no wonder that Michael is known as the Divine Protector. Call upon Michael and his angels whenever you need protection of any kind, including both physical and spiritual. Archangel Jophiel. He is the archangel of the yellow-gold ray of illumination. Jophiel is the archangel to call when you need to learn new things, need inspiration, or need anything that has to do with study and knowledge. Archangel Chamuel. The beloved Chamuel works under the Pink Ray, which is the ray of divine love. Tolerance and devotion are other attributes of the Pink Ray. You can ask Chamuel and his angels for help with your relationships. Archangel Gabriel. Best known for announcing Jesus’ birth, Gabriel serves on the White Ray. This is the ray of ascension, beauty, purity and perfection. You can invoke Gabriel whenever you need to establish order and/or bring beauty to any aspect of your life. Archangel Raphael. Heaven’s healer, Raphael is the angelic director of the Green Ray, which - as you may have guessed - is the ray of healing. It is also the ray of truth, harmony, science, and music. If you are in need of any kind of healing – be it physical, emotional, mental or spiritual, call upon Raphael and his healing angels for assistance. Archangel Uriel. He is the archangel of the Gold-Ruby Ray, also known as the ray of peace, divine providence, supply, and divine grace. Ask Uriel for help whenever you need peace or supply of any kind. Archangel Zadkiel. This powerful archangel serves on the Violet Ray. Forgiveness, transmutation, compassion, and freedom are some of the gifts bestowed by this ray. If you need to forgive anybody or anything (even yourself) and have difficulty with the process, ask Zadkiel for his help. And help me attain spiritual freedom.